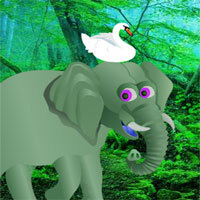 BigEscapeGames - Big Elephant Land Escape is an escape game developed by Big Escape Games. A big escape game with tough puzzles. In this game, you came to see the beauty of an elephant land. But unfortunately, you missed the way out. There is no one to help you. You have to find the way to escape from there by finding useful objects, hints and solving puzzle. Click on the objects to interact with them and solve puzzles. Good Luck Have Fun! Hint for the 4 colors for the 4 flowers is in second set of scenes. Math; how does white make yellow! Go back to the first set of scenes to use the paper. It wasn't a question, Hotzenplotz, it was a subtle hint for other players. oh, I misread your comment. Good game, some nice puzzles there. Lol, are you 'Ratschel', Hotzenplotz? Nvm, thought you were the one that just beat me in the score list. Humph, in the middle of playing when a Mayfair ad came up and wouldn't get off. I kept clicking the "X" off to the right and nothing let me get the ad off. Usually like playing but won't start over. Don't get the math. Could someone please spoil it. But I still don't understand why. 2,8,4 are sums of two digits around each. It's a Flash problem. I can't run G2R or Big Escape Games on EG24 anymore. Try the 8b games site - Flash runs there. But the games don't come up as quickly there, so you may find that folks have passed you by. But for me, it's the only alternative right now until EG24 fixes the Flash issue.